Japan plans to develop a prototype of an advanced fighter jet in the hope it will spur the United States to review a ban on selling F-22 fighters, a news report said Tuesday. But an official of the Defense Ministry said no decision has been reached. Japan's largest daily, The Yomiuri, said the Defense Ministry plans to request a budget for the next year to build the test model of a stealth fighter jet. The project is expected to cost billions of yen (hundreds of millions of dollars and euros) over the next 10 years, the report said, without saying where it got its information. It would be the first time since the 1970s that Japan has developed its own fighters, although the Yomiuri said developing the prototype would not necessarily lead to the actual development of stealth jets. Japan's agreement with the U.S. to jointly produce F-2 fighter jets ends in 2011, and Tokyo wants to build on the technology base achieved during that relationship, the paper said. Japan has expressed interest in advanced F-22 fighters. However, the U.S. Congress has repeatedly banned the sale or license of the F-22 "Raptor" to any foreign government, largely to safeguard its advanced technology. The latest attempt to repeal that ban was shot down in the U.S. Senate earlier this year. A Defense Ministry spokesman said the ministry has been studying stealth fighters but has not begun considering building a prototype. He also said no decision has been reached regarding the budget request as reported by Yomiuri. The spokesman spoke on condition of anonymity, citing protocol. 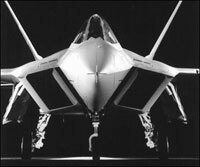 The F-22 was originally designed by the U.S. to counter the threat of advanced Soviet Su-27 fighters during the 1980s. Though that threat has diminished, Japan now is seeking to counter a Chinese fleet of those same fighters. Yomiuri said by showing interest in building its own fighters, Japan apparently hopes the U.S. might review the current ban and cut prices of the F-22, which costs US$130 million (EUR 94.06 million) a plane. The report said it is not certain developing the prototype would lead to developing stealth fighter jets in Japan.